This Oval Retro Dinette Table 36×48 with Retro Chrome Legs is shown in premium red cracked ice laminate with our exclusive 3″ Groovy Insert Metal Banding and retro double pole chrome legs. PLEASE NOTE….the image shown is a 36×60 table! This fabulous table being offered is 36″ x 48″, and provides perfect seating for four. The set is available in your choice of standard or premium boomerang or cracked ice laminates, metal banding sizes, and classic double pole legs. You may also upgrade to our custom 3″ Groovy Insert Banding. 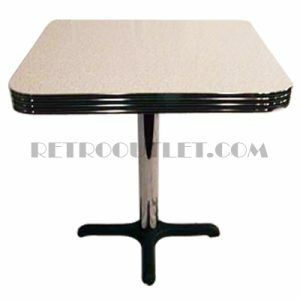 Please allow 4-5 weeks for production of your retro diner table.